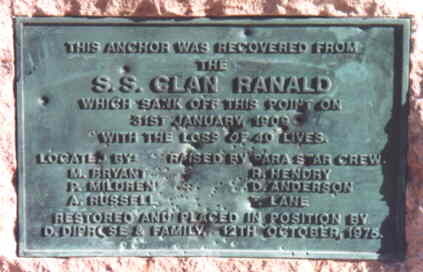 The Clan Ranald is one of the most tragic and unique shipwrecks in Australian waters. It represents one of the worst shipwrecks in Australian history with a massive loss of life. Combined with the grave sites of the officers and the crew in the nearby Edithburgh Cemetery, the Clan Ranald is a somber reminder of a huge tragedy. For this reason, the wreck site and the event itself is very important to the community of the lower Yorke Peninsula, not only because of the disastrous loss of life, but also because they played a major role in aiding the survivors. Even to this day, if you visit the graves, there are fresh flowers near the headstones. The steamer, Clan Ranald, swept proudly away. What was in store for them God alone knew. She listed right over; her decks washed a-lea. But ere it arrived the ship was no more. For forty poor souls were called to their Master. They were risking their lives for the sake of those living. In surf they were rushing to save, black and white. Who were washed to Eternity off Troubridge Hill. SS Clan Ranald was built in 1900 by Doxford & Sons in Sunderland, UK, as a turret deck ship for the Clan Line Steamers of Glasgow. The ship measured 355 ft in length and had a net tonnage of 2,285 tons. The turret deck ship design was a modern idea for the beginning of the 18th century, as it was considered seaworthy and economical for carrying bulk grain cargoes. The sides of the vessel curve inwards after reaching the widest point, this creates a semi-ledge that sits about midway up the veesels hull. The purpose of this construction, together with increased stoage capacity, is to make the cargo so compacted that it would have minimal shifting during transportation. However, the main advantage of the design is the cost reduction of port charges. Turret ships offer lower tonnage per ton (which could be up to 10%) and that the narrow turret deck enabled a reduction in Suez Canal dues where charges were based on deck width and the net tonnage. On 15 January 1909 the vessel arrived in Port Adelaide from Mauritius. At Darling’s Mill, the ship took on 39,862 bags of wheat and 28,451 bags of flour. A large amount of coal (638 tons) was also loaded, with 170 tons on the top decks. On the 31st of that month, despite a 4° list to starboard Clan Ranald left the Semaphore Anchorage, bound for South Africa with a crew of 64 people. The ship's crew consisted of four Manilamen, sixteen Calcuttamen and 34 Lascars.The ship was commanded by Captain A.S. Gladstone. At 2 pm the ship was south of Troubridge Island when it suddenly shifted onto its starboard side at a 45° angle. The crew rushed onto the deck whilst leaving the engine running. The starboard deck was submerged and this caused the ship's rudder to sit out of the water. At 4.30 pm a rough wind blew the ship towards Troubridge Hill. Due to rough seas, the ship's lifeboats had been smashed and the vessel was driven near the cliffs. In their desperation to escape, the crew attempted to construct wooden rafts from debris. Distress rockets were fired after seeing a nearby ship, the SS Uganda, but strangely they never sent assistance. At 10 pm the Clan Ranald capsized and sank in 20 metres of water about 700 metres from the shore, pitching the crew into the sea. Many were sucked under as the ship sank while others who swam to shore died when they reached the steep cliffs and jagged rocks that were nearly impossible to climb to safety. Others perished after being subjected to the freezing elements all night. Even though the distress rockets were overlooked by the SS Uganda, some of the Troubridge locals saw them. 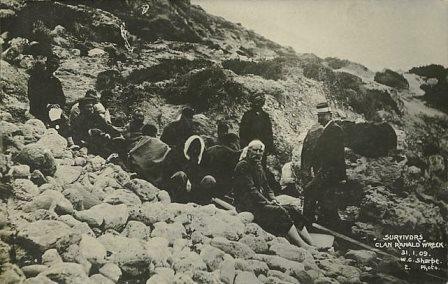 They rushed to the beach and gave assistance to the any of the surviving crew. The locals also began searching for other survivors on the beach and were shocked by the terrible loss of life they found along the shoreline. Some bodies that were found were battered beyond recognition. Only 36 of the missing bodies were found, which were buried in Edithburgh Cemetery. The five British officers were buried in the main section and the 31 Lascar crew were buried in a mass grave at the rear of the cemetery. At daylight, the 24 survivors were taken to Edithburgh to return to Adelaide. Out of the 24 survivors four of them were British while the other twenty were Lascars. The four British officers were taken to Woodcock’s Royal Arms Hotel, while the Lascars were placed in the basement of the Prince Alfred Sailors Home. As part of the White Australia Policy, the Lascar survivors had their hand print taken and were given a dictation test, which was fixed for them to fail. As a result, the Lascars were treated as illegal immigrants regardless of their recent tragedy. This was due to the terms of the Immigration Restriction Act 1901 which is related to the White Australia Policy. Due to this, they were promptly sent to Melbourne to board the Clan McLachlan bound for Colombo. However, the Lascars survivors were not treated badly, they received support from the people of Adelaide. The survivors were given food, clothing and cigarettes whilst they were in custody. Even before departing the Mayor of Adelaide presented each with a monetary gift and wished them well. Questions were raised on why the SS Uganda did not come to give assistance when the distress rockets were fired. The captain of the ship, Captain Kilpatrick, stated that he thought the lights were from Troubridge Lighthouse, and were not distress signals; as a result, he continue on according to procedure. This excuse was challenged by the fact that the locals nearby could see and identify the lights as distress signals. Furthermore, one of the survivors stated that the SS Uganda did answer the distress signal by replying with an answering light. This suggests that they knew what it was but did not came to help them. There was never any formal salvage of the site. However, since the invention of recreational SCUBA diving in the 1960s, looters have been frequenting the site and noticeable materials have been removed. Such materials that have been targeted are non-ferrous materials, such as copper alloy piping off the boilers and any interesting personal artefacts. Looters have also used explosives on the site, including destroying the propeller blades. The Clan Ranald site was located in 1962 by the South Australian Museum Underwater Historical Research group, a volunteer organisation. At this time the site was deemed to be in a remarkable state of preservation. The site lies of the southern tip of the Yorke Peninsula in South Australia. The closest town to the site is Edithburgh, from which the wreck lies 14 kilometres to the south-west and 1.25 kilometres west of Troubridge Hill in the Troubridge Hill Aquatic Reserve. "The highest part of the ship is her port bilge [sic] keel and the starboard bilge keel is about 9 ft. off the bottom. The starboard top sides and the top of the turret had sunk some distance in the sand. There is a considerable quantity of coal scattered to the eastward of the ship." The Clan Ranald was lying on an ESE-NWN axis with the bow pointing ESE. Presently there are still considerable remains of the Clan Ranald left on the site. Almost the entire hull has collapsed, except for a portion that is held up by the port side boiler. The double hulled bottom of the bow is standing vertical and the bow section has collapsed forwards and downwards into two parts. There are still enormous boilers that remain on site, approximately 2-3 times the size of a diver and provide a spectacular site for anybody who visits the site and the port main boiler has rolled out and is free of the hull remains. Underneath the collapsed hull, the engine still remains relatively intact. The Propeller: This still remains on the site, however, illegal salvage[disambiguation needed] using explosive destroyed and removed the blades. The propeller shaft is still visible under the collapsed hull. At the bow area, the windlass and a large mound of chain remain. The rudder also remains on site, although it has been detached from the stern, possibly as a result of explosives used to remove the propeller blades. The highest part of the wreck sits 6 meters above the seabed, the port bilge keel and the double bottom hull which is resting on the starboard main boiler. The Merchant Shipping Act, 1894. REPORT of a Court of Inquiry held at Port Adelaide, South Australia, on the 3rd, 4th, 5th, 8th, and 9th days of February, 1909, into the circumstances attending the loss of the s.s. "CLAN RANALD," of Glasgow, off Troubridge Hill, Gulf St. Vincent, on 31st January, 1909. An inquiry was held at the Marine Board Offices, Port Adelaide, on the 3rd, 4th, 5th, 8th, and 9th February, 1909, before Arthur Searcy, Esquire, J.P., President of the Marine Board of South Australia, and W. Berry, Esquire, Angus Campbell, Esquire, J.P., R. Fricker, Esquire, F. W. Vasey, Esquire, A. S. Neill, Esquire, J.P., and P. D. Haggart, Esquire, J.P., into the circumstances connected with the loss of the British steamship "Clan Ranald," in the Gulf St. Vincent, off Troubridge Hill, on the night of the 31st January, 1909. 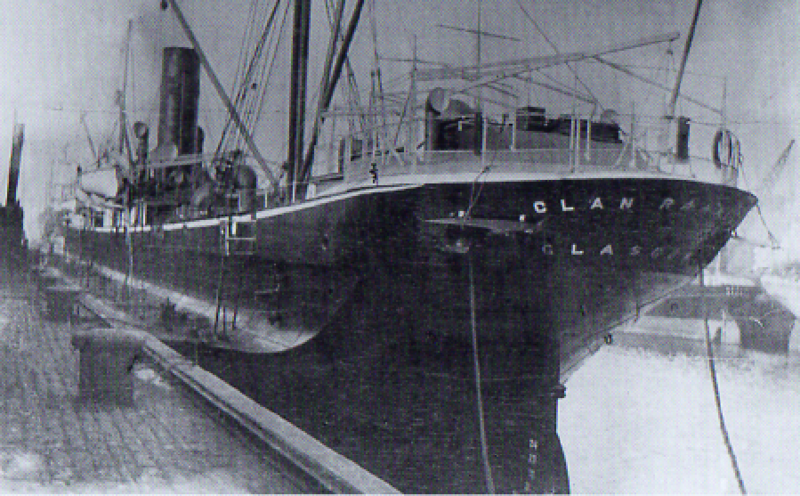 The "Clan Ranald," registered at Glasgow, Official Number 111290, was a schooner rigged turret steamer, built of iron in 1900, 2,286 tons register, owned by Messrs. Cayzer, Irvine & Co., of Glasgow, and under the command of A. S. Gladstone, who held a certificate of competency as master, No. 010424, issued by the Board of Trade. The first information of the casualty that reached the Board was a telegram, dated the 31st January, from the Harbour Master at Edithburgh, stating that a steamer was drifting towards shore, about two miles out, abreast of Troubridge Hill, and shortly afterwards a further telegram was received from the same source that she had sunk and that most of the crew were drowned. The "Clan Ranald," laden with grain and flour, left the harbour of Port Adelaide, bound for South Africa, via Albany, Western Australia, at 7 a.m. on the 31st of January, the weather being fine and clear, with a strong breeze from the S.S.E. At the time of departure she had a list of four degrees to starboard, but the evidence shows that upon reaching the open sea the list increased to six degrees ; this list, however, did not further increase as the vessel proceeded down the Gulf, and was no greater when abreast of Troubridge Island Light at 12.10 p.m. The course steered from the time of leaving the Semaphore Anchorage at 9.10 a.m. until noon was S. 50° W., true, when it was found that the ship had been set northward and westward, and the chief mate, who was in charge, hauled her out half a point, making the course S. 45° W., true. At 12.50 the course was again altered to S. 73° W. (by compass) to pass three miles to the southward of Althorpe Island. At about 2 p.m., when on the last-mentioned course, the vessel suddenly heeled over to starboard, placing that side of the turret deck under water, and she never righted again. The ship was still on her course, rockets were fired, and then the helm was starboarded with a view of counteracting the list, but it had no effect. About 5 p.m. the helm was put hard aport, the propeller still continuing to revolve slowly, hoping that it would put the ship towards shore. About 8 p.m. the anchor was let go with 90 fathoms chain outside, which brought the ship's head to wind and sea which was described as moderate; the anchor held, but the vessel still maintained her dangerous angle until about 9.30 p.m., when the tarpaulin covering of No. 5 hatch came off, and she began to settle down and increase the list, and about 10 p.m. she sank out of sight. The vessel's ballast tanks, it is proved, were pumped dry before leaving Port Adelaide, and the well was sounded in the river shortly before reaching the anchorage, and the witnesses examined all affirm that there was no possibility of water getting into the vessel. She was practically a full ship, having approximately 6,600 tons of cargo on board, and in addition had 70 tons of coal on the turret deck 50 on the starboard side and 20 on the port side and about 50 tons on each side of the fiddley deck. It was stated that the ship was well found, in good condition, and had a crew of 64 all told, 24 of whom reached the shore by such boats, &c., as were available, or by swimming. Forty were drowned, including the master, chief engineer, second mate, third engineer, fourth engineer, and chief steward. There is no evidence as to the value of the vessel, or what amount, if any, she was insured for, or as to the value of the cargo or insurance thereon. The Board having taken all evidence available, extending over five separate meetings, and after the fullest investigation, have failed to elicit any evidence which clearly accounts for the sudden careening of the "Clan Ranald" on Sunday, 31st January. A theory is advanced by experts that no shifting of cargo occurred as a cause of the wreck, and, again, that entrance of water into the vessel, unknown to her officers, could alone account for her suddenly heeling over about 2 p.m. on the above date. It has been thought, on the other hand, by some members of the Board, and this view is supported by the first and third officers and the second engineer (who survived), that although coal had been safely carried on her bridge and main decks on previous voyages that when she left Port Adelaide on her final voyage the weight of coal on her deck, coupled with her six degrees of starboard list on starting, was apparently sufficient to endanger her stability. The Board are satisfied that the "Clan Ranald" was well found in every respect, and that her cargo was properly stowed. The Board have to regret that the master (who has not survived) had to leave the performance of his duty as master, through indisposition, to the chief officer. The Board, after this full investigation, cannot find any valid ground for suggesting charges against any of the surviving officers, and as regards the deceased officers who were on watch, there exists no evidence to show that they neglected their duties. The Board, having received a sworn statement from the master of the s.s. "Uganda" in explanation of his not having gone to the assistance of the vessel when passing up the Gulf St. Vincent, accept the same as satisfactory. In all probability had the officers of the "Clan Ranald," at once after the disaster, fired the distress sound signals, assistance would have been forthcoming. As reflecting on the discipline of the ship, it was elicited during the inquiry that two fires had occurred in the port coal bunker during the ship's stay in port and had not been reported to the authorities. The Board are of opinion that an error of judgment was committed in anchoring the ship after heeling over at 2 o'clock. The Board find that the surviving officers and men behaved well after the accident at 2 p.m. The Board further desire to express their sympathy with the relatives of the lost officers and members of the crew. The loss of all the officers on watch at the time of the disaster has necessarily rendered the task of the Board more difficult in trying to get at the actual cause of the accident.